Demontre Hurst (born March 24, 1991) is an American football safety for the Chicago Bears of the National Football League (NFL). He played college football at Oklahoma. Hurst played high school football for the Lancaster High School . He recorded 75 tackles, three fumble recoveries, one forced fumble, five interceptions and one interception return for a touchdown his senior year. Hurst played from 2009 to 2012 for the Oklahoma Sooners. Hurst was signed by the Chicago Bears on April 28, 2013, after going undrafted in the 2013 NFL Draft. On August 31, 2013, Hurst was released by the Bears. On September 4, 2013, Hurst was signed to the Bears' practice squad. On December 11, 2013, Hurst signed a futures contract with the Bears. On September 8, 2014, Hurst was released by the Bears. On September 18, 2014, Hurst was re-signed to the Chicago Bears' 53-man roster. On October 12, 2014, Hurst recorded his first interception of his career, intercepting Matt Ryan in the 4th quarter. On September 19, 2015, Hurst was released by the Bears. On September 22, 2015, Hurst signed to the Chicago Bears' practice squad. On October 7, 2015, Hurst was promoted to the Bears' 53-man roster. On October 19, 2015, Hurst was released by the Bears. On October 21, 2015, Hurst was signed to the Bears' practice squad. On December 12, 2015, Hurst was promoted to the Bears' 53-man roster. On September 3, 2016, Hurst was released by the Bears as part of the final roster cuts. On September 4, 2016, Hurst was signed to the practice squad the next day. On October 8, 2016, Hurst was promoted to the Bears' 53-man roster. On October 10, 2016, Hurst was released by the Bears. On October 12, 2016, Hurst signed to the Bears' practice squad two days later. On October 25, 2016, Hurst was promoted to the active roster. 1 2 "Demontre Hurst". soonersports.com. Retrieved September 8, 2014. ↑ "Demontre Hurst". nfldraftscout.com. Retrieved September 6, 2016. ↑ Mayer, Larry (2016-04-28). "Bears add 10 undrafted free agents". Retrieved 2016-10-29. ↑ Mayer, Larry (2013-08-30). "Bears cut 17 players, still have five to go". Retrieved 2016-10-08. ↑ Mayer, Larry (2013-09-01). "Bears add seven players to practice squad". Retrieved 2016-10-08. ↑ Wiederer, Dan (2013-12-30). "Charles Tillman on return to Bears: 'I have some options'". tribunedigital-chicagotribune. Retrieved 2016-10-08. ↑ "Bears Sign S Ahmad Dixon, Waive CB Demontre Hurst". chicago.cbslocal.com. Retrieved September 8, 2014. ↑ Wiederer, Dan (2014-09-18). "Bears re-sign cornerback Hurst". chicagotribune.com. Retrieved 2016-10-08. ↑ Biggs, Brad (2014-10-13). "10 thoughts after Bears' win over Falcons". chicagotribune.com. Retrieved 2016-10-29. ↑ "Sport GIFs & Videos: Demontre Hurst interception of Matt Ryan Chicago Bears vs Atlanta Falcons". Sport GIFs & Videos. 2014-10-12. Retrieved 2016-10-29. ↑ Campbell, Rich (2015-09-19). "Bears promote DE Brandon Dunn". chicagotribune.com. Retrieved September 19, 2015. ↑ Biggs, Brad (2015-09-22). "Bears promote David Fales to 53-man roster". chicagotribune.com. Retrieved 2016-10-08. ↑ Jr, Lester A. Wiltfong (2015-10-07). "Bears elevate Demontre Hurst to the active roster". Windy City Gridiron. Retrieved 2016-10-29. ↑ Wiederer, Dan (October 19, 2015). "Bears waive cornerback Demontre Hurst". chicagotribune.com. Archived from the original on October 20, 2015. Retrieved October 20, 2015. ↑ Jr, Lester A. Wiltfong (2015-10-21). "Bears sign Demontre Hurst to the Practice Squad". Windy City Gridiron. Retrieved 2016-10-08. ↑ Wiederer, Dan (2015-12-12). "Bears send receiver Marquess Wilson to IR with foot injury". chicagotribune.com. Retrieved 2016-10-08. ↑ Mayer, Larry (2016-09-03). "Bears trim 22 to reach 53-man limit". Chicago Bears. ↑ Emma, Chris (September 5, 2016). "Bears Sign Demontre Hurst, Cornelius Edison To Practice Squad". chicago.cbslocal.com. Retrieved September 6, 2016. ↑ Mayer, Larry (October 8, 2016). "Bears add Hurst to roster, cut Wilson". ChicagoBears.com. ↑ Mayer, Larry (October 10, 2016). "Bears elevate Bausby, waive Hurst". ChicagoBears.com. ↑ Mayer, Larry (2016-10-11). "Bears re-sign Hurst to practice squad". Retrieved 2016-10-29. ↑ Bouda, Nate (2016-10-25). 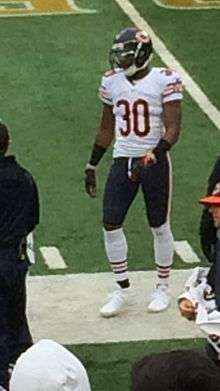 "Bears Promote DB Demontre Hurst To Active Roster, Waive DB Jacoby Glenn". NFL Trade Rumors.